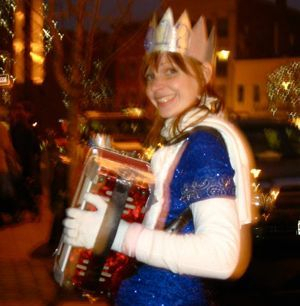 The accordion entered Sophie's life when she studied abroad in Seville, Spain as a junior in college in the spring of 2009. 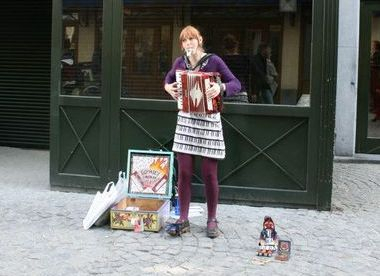 On her daily walk to school she passed several accordion players on the street, and fell in love with the instrument. 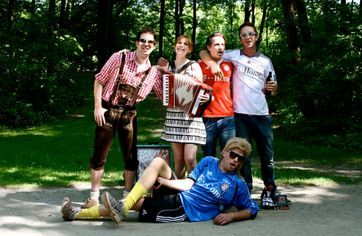 She announced to her friends and family that she would buy a used accordion and learn to play it that summer. Sophie then broke her wrist, so she put the accordion plan on hold. Her wonderful parents, however, didn't. They fought hard (on the 4th of July!) to win an accordion on eBay for their daughter. The twelve-bass, red, Iorio piano accordion arrived in time for Sophie's 21st birthday. Her left wrist still wasn't up for fully playing it, but she limped her way through the first couple months of practice. Sophie was able to pick up the 12-bass piano accordion fairly easily due to her background playing piano, which she began at the age of five. Sophie confined her playing to her home for the first several months that she played. The pair had their debut performance in January of 2010 at a variety show at Clark University benefiting Haiti earthquake relief initiatives. Their performance was highly successful, and earned their image a spot on the cover of the university's student newspaper. 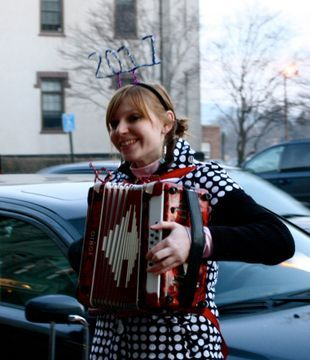 The summer of 2010 marked the beginning of Sophie and her accordion as a street performing act. 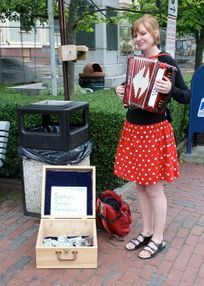 Sophie got a job on Cape Cod, and thought she would try busking. She got a positive response from the residents and tourists of Provincetown, MA, and made performing her primary activity for the summer. The duo found some local fame through appearances in publications, on local TV, and invitations to play at local events. They submitted footage to Youtube's "Life In A Day" contest, and made it to the semi-finals. 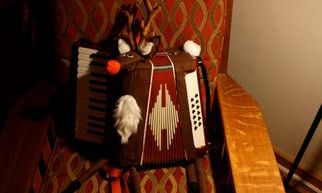 After the tourist season wound down in Provincetown, Sophie sewed an elf costume for herself and a reindeer costume for her accordion. She learned some holiday songs and took to the streets of Boston, but was deterred after just a week due to the low temperature. 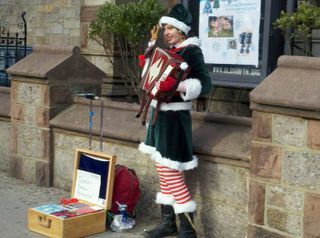 She continued to be an elf in Northampton, MA, and squeezed in the new year at First Night there. Sick of the cold, Sophie's Smokin' Squeezebox jetted off to San Francisco for the winter, where they played for three months. After some sporadic playing where Sophie's travels took her, the pair headed back to Cape Cod for a second summer, followed by a second December of holiday busking. Sophie's Youtube channel caught the eye of a scouting agent at the TV competition "America's Got Talent" who invited Sophie to audition for the show, an invitation she has declined (for now). 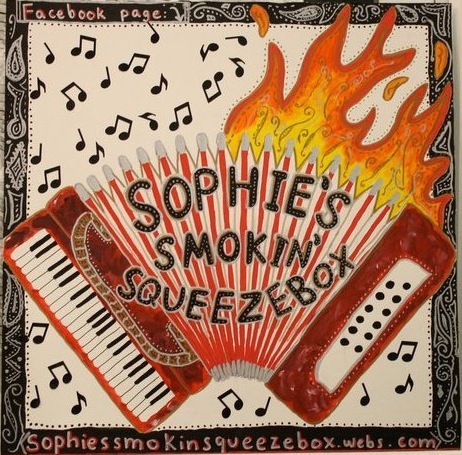 In January of 2012, Sophie's Smokin' Squeezebox at the last minute decided to follow her heart to Edinburgh, Scotland. 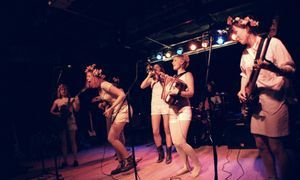 This city became her home for ten months, where she joined the band KAIHO, sang in a choir, and formed lifelong friendships with fellow buskers. During this time Sophie went "on tour" around Europe, and performed in Belgium, France, Switzerland, Germany, Austria, the Czech Republic, Denmark, and Iceland. 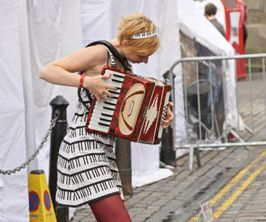 Back in Edinburgh she performed at the world-famous Edinburgh Fringe Festival, where she had the privilege of meeting dozens of incredible buskers from around the world. 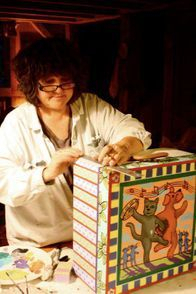 Sophie's act adopted many appearances that year, first with the addition of percussion instruments on her feet and a kazoo, and then with the creation of her puppet theater. 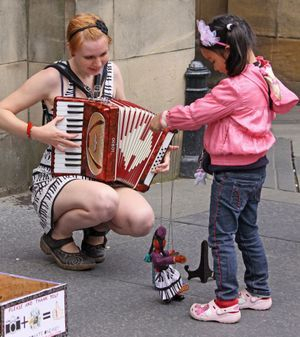 Sophie had purchased her first marionette, Flaca, at a folk art market in Mexico City. Although Sophie made her a piano dress, Flaca's first job was just to sit in the tip box. Soon she moved six feet away where she sat with her own tiny tip box (foreshadowing of the "miniature everything" of Sophie's puppets' future), giving spectator's the option to choose which box to fill. 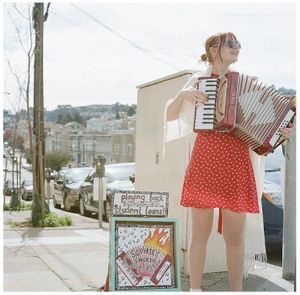 After her first Fringe, Sophie, with help from other buskers, turned her accordion box into a puppet theater, complete with a red curtain and faux-parquet dancefloor. Now, in addition to playing accordion, Sophie would tap her right foot, causing Flaca to move back and forth between her own feet: "dancing." Additionally, when Sophie moved her left foot, Flaca would fling her right arm to the side in a theatrical gesture. This new version of the act accompanied Sophie on her fall Europe tour. When Sophie returned home to Massachusetts, she quickly made Flaca an elf costume for their first Elf season together. In 2013, Sophie continued to become familiar with her new show. She attached a bike bell to the box that Flaca's flinging arm would hit, and debuted this trick at the annual Really Big Show in Northampton, That summer she returned to Cape Cod for a third season, and was fortunate to be given preferential treatment by Ross, manager at Cabot's Candy in Provincetown, enabling a smooth summer of busking outside his shop. Between busking and two restaurant jobs, Sophie was able to save up enough money to travel the following year. 2014 brought Sophie's first intentional hiatus from busking: a trip to South America! In December of 2015, Sophie and Sylvie moved to Cambridge, MA, and completed their Elf season in Harvard Square. Look for them in Boston and Cambridge subway stations in 2017! New Year's Eve 2010: Sophie plays her first First Night in Northampton and realizes it is very lucrative. She gets home very late that night and says goodnight to the nearly-20-year-old cat who then dies before morning. What a run! May 2011: Sophie begins a second summer on Cape Cod, and sews her first piano dress that August for the "Don't Stop the Music" themed Provincetown Carnival. This becomes her default busking dress. 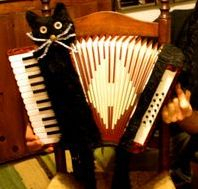 Halloween 2011: Sophie busks in a witch costume while her accordion wears a black cat costume. 2012: Sophie progresses her act. 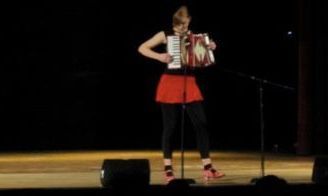 For a while she does a one-woman band routine, in which she plays kazoo in addition to accordion and straps percussion instruments to her feet. She thinks it sounds awesome but a trusted busker friend tells her her rhythms are real bad. 2012: Sophie sews a matching piano outfit (with purple sweater and hat) for Flaca. She is integrated into the act by sitting near Sophie with her own tip box and allowing children to play with her. August 2012: Sophie's first Fringe Festival! Halloween 2013: The Red Sox won the World Series!!!! That is all. May 2014: Sophie buys new puppets at the Brimfield Fair; a Hansel and Gretel set. She spends the month turning Gretel into Sylvie, and artist Lindsay replaces the self-adhesive Scottish DIY linoleum "wooden" dancefloor with a painted "wooden" parquet floor. Summer 2014: Sophie has a very fun summer in Český Krumlov, in the Czech Republic. She lives and volunteers at a hostel and busks by night. She learns that Czech people really love heavy metal and make requests accordingly. She agonizes over her new puppet's name and eventually chooses Sylvie. Winter 2014: Elf and First Night in Northampton! 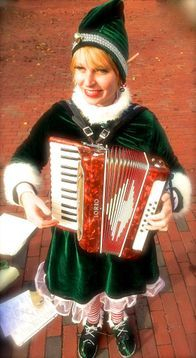 December 2015: Sophie's moves to greater Boston and does her sixth Elf Season in Harvard Square. She has a fabulous First Night experience and gets her photo on the front page of the Boston Globe with fireworks behind her. She feels very important and famous after this. Winter 2016: Sophie gets her MBTA permit and busks in the subways. Spring/Summer 2016: We'll have to see!